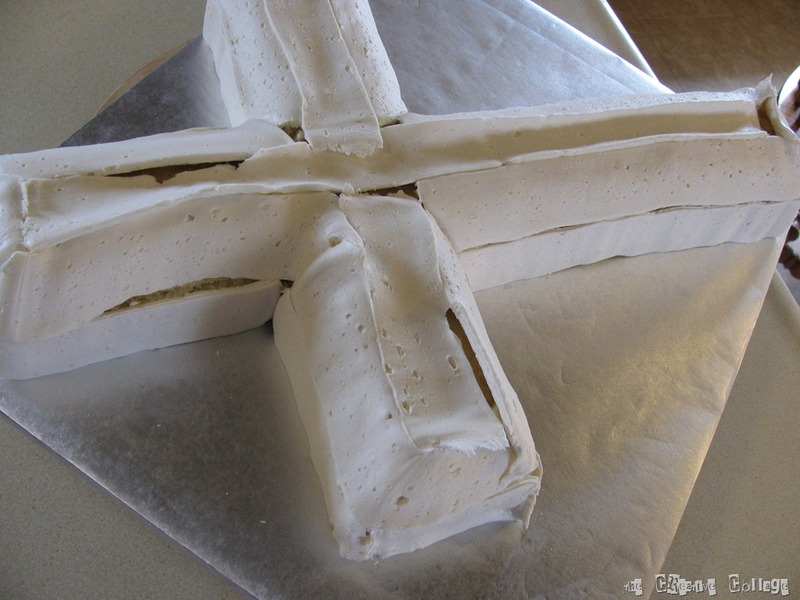 Creating a Cross Cake | Welcome to the Creative Collage - Come In and Stay Awhile! 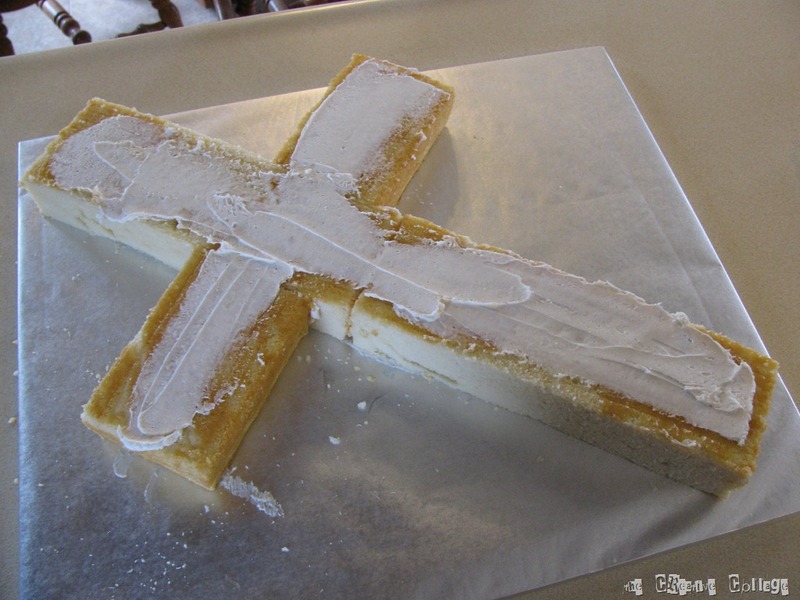 With the Easter Season soon approaching, I thought I would do a tutorial on how I do a cross-shaped cake. I do not like to buy all sorts of shaped pans, because the sizes are so limiting and you may only need to make that type of cake once! 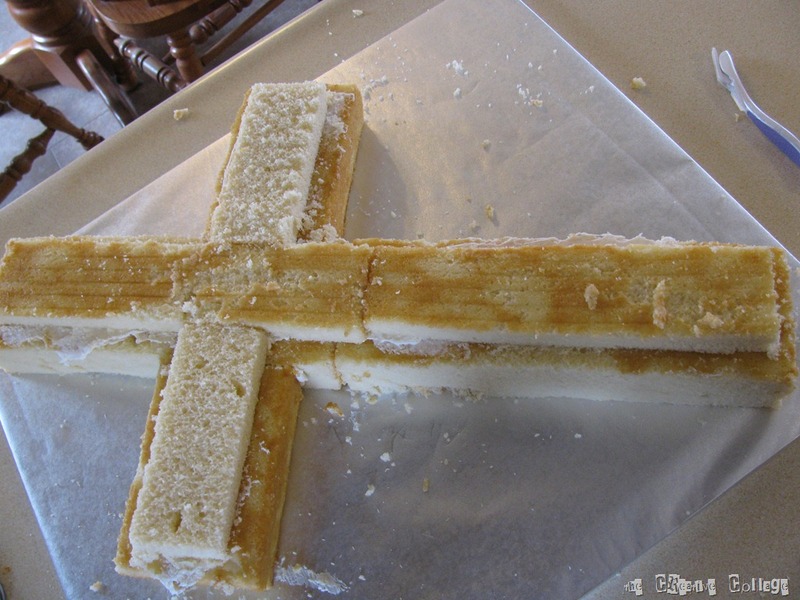 So I have come up with a way to make a nice-sized beveled cross out of a sheet cake. The nice part of it is that I’m able to offer different sizes to my customers. 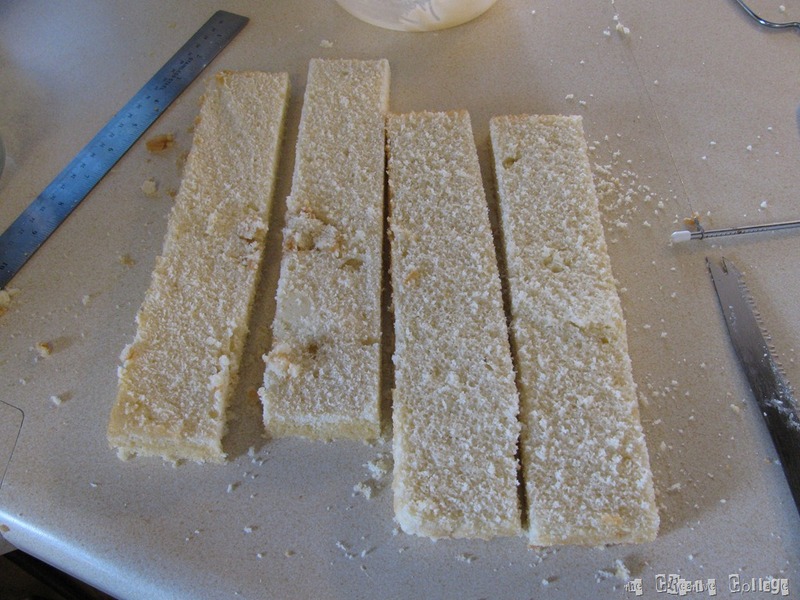 After baking and cooling, you cut off the extra part of the rectangle to make one equal sized square. This was an 11×15 cake so my square ended up being 10.25” by 10.25” (with the shrink after cooling). Then divided that square into 3 equal strips. You can then place 2 of the strips in one line and cut the 3rd strip in half and add to either side of your main cross strips. This shows how the square is cut and laid out. I have also added some frosting to help the next layer stick. If you didn’t want a beveled look you could just bake up any square- sized cake (or cakes if you want a full 2 layer cake) and frost and decorate as you like. 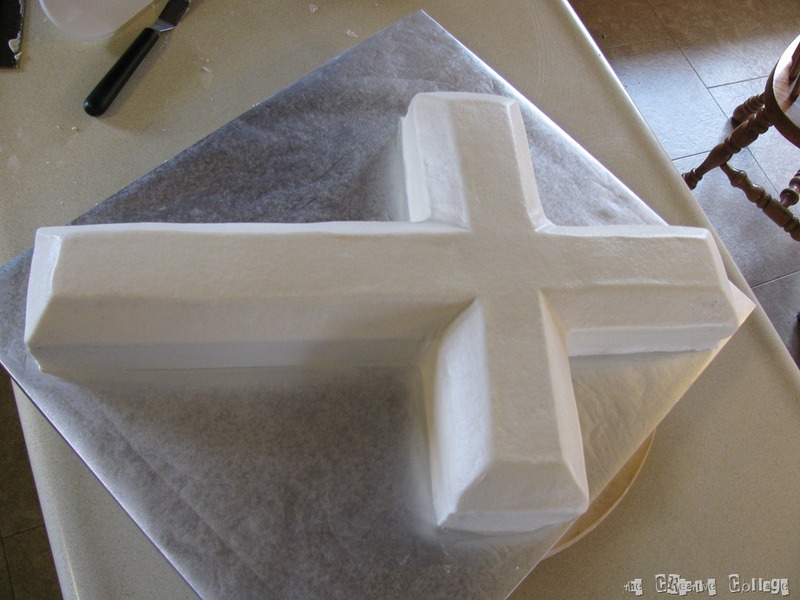 Next we are going to be working with the excess of the sheet that you cut off to make the square which formed the base of the cross. 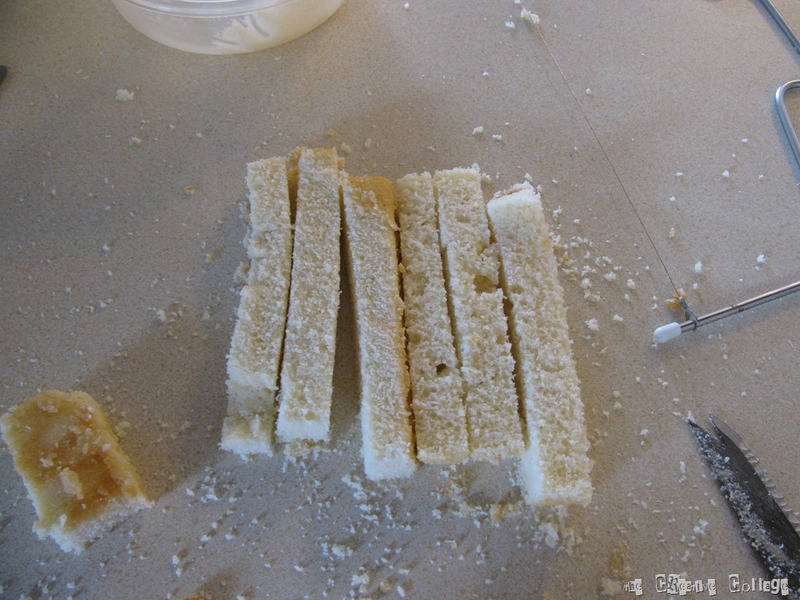 I torted – or cut the piece in half through the middle to make 2 shorter pieces. These 2 pieces were then cut in half to create 4 small strips. You can then center these narrower, thinner strips over the cross cutting off the excess and leaving a 1/2” of so uncovered on all the ends/arms of the cross. Okay – so this part is a little tricky to explain and show, hopefully I don’t lose anyone! I took what I had left of the smaller strips and cut them down into about 1/2” strips. These are going to be used to create the bevel between the 2 layers of cake. 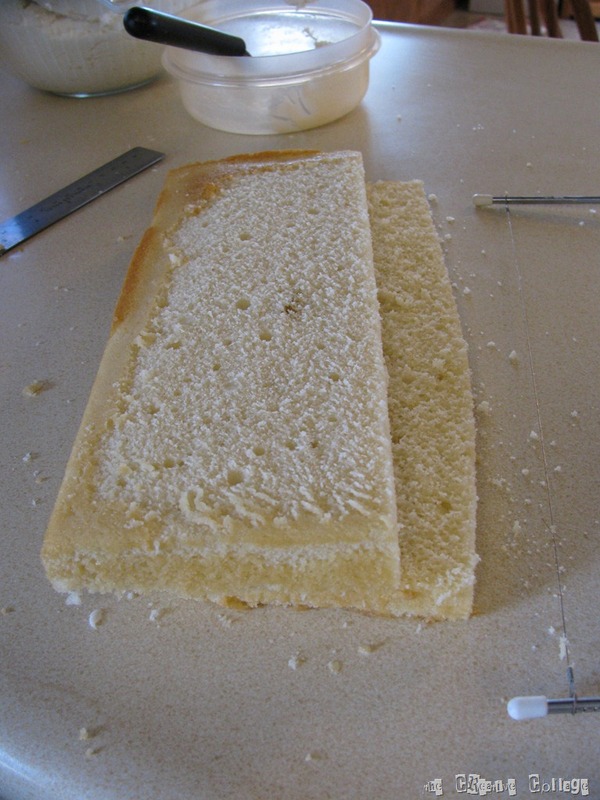 Here, you can see I start by adding some icing to help the pieces stick and placing the small strips directly beside and on top of the other layers filling the gap I left with the narrower strips on top. You will not have enough scraps to cover all the gaps. When I have placed all the excess that I had, I start to cut the beveled edge – using the cut strips to create the bevel on the areas not covered. So – I’m starting at the top right where the small strip meets the edge strip and angling a cut down to the top of the bottom layer. If you flip it around, it will fit perfectly in a bevel space that is still empty. Make sense?!?!? I have to use ALL the scraps, plus some of the stuff that was shaved off in the initial leveling. I really like this part, because there is very little waste – and the customer gets all the cake that they pay for! 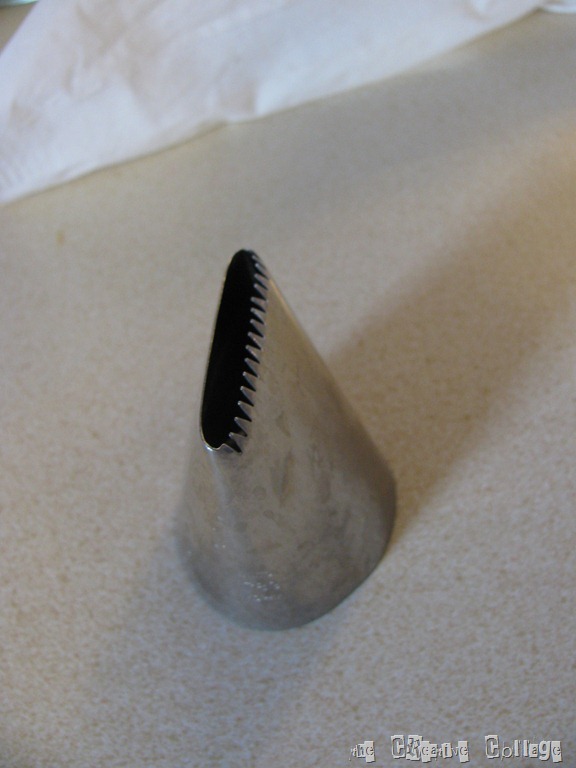 This next tip is huge, especially if you are new to cake decorating: buy and use a large icing tip! This is really true when you have so many cut edges. The cake will crumble and your frosting will be a mess otherwise. 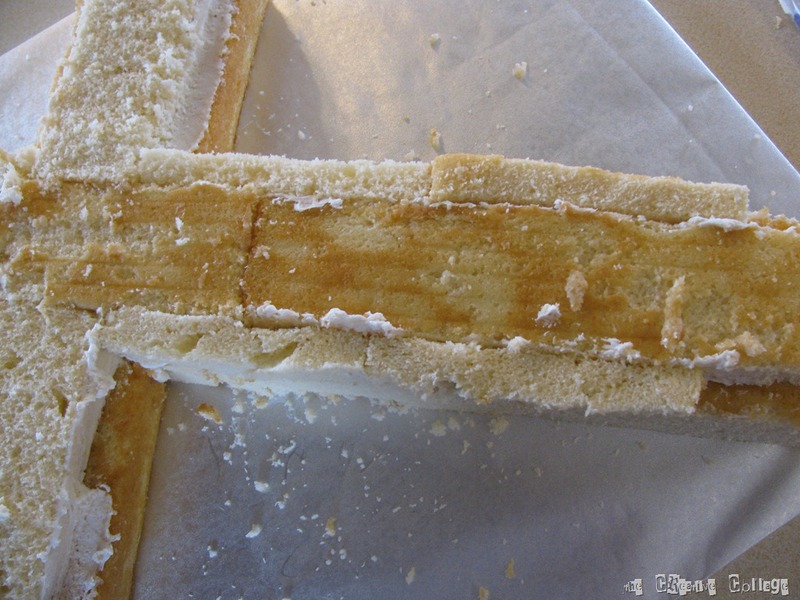 Pipe the strips of frosting on…I usually start with the sides, then the bevel and then fill in the top. Take your icing spatula and smooth out the frosting. I do my final smoothing with the Viva method (see CakeCentral for more details on that) and a fondant smoother. And this is what you end up with! 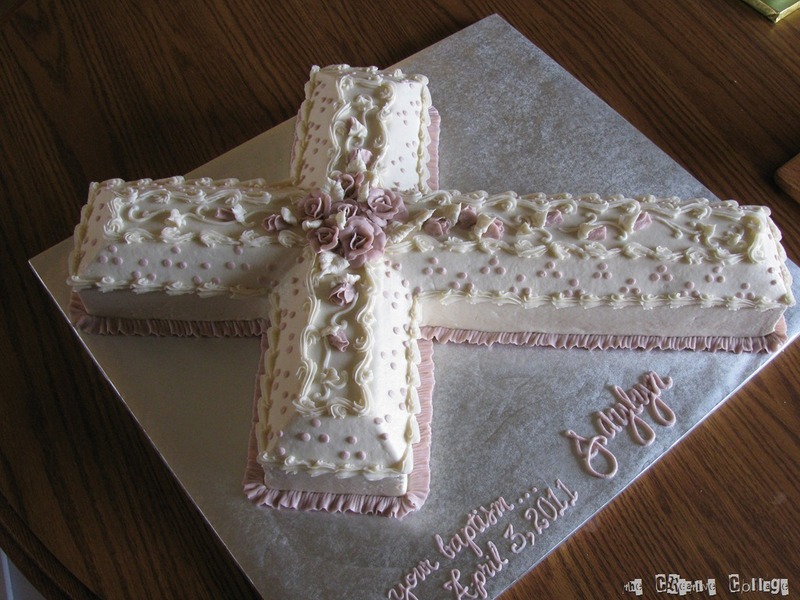 A nicely beveled cross-shaped cake! This is how I decorated the cake you see above. 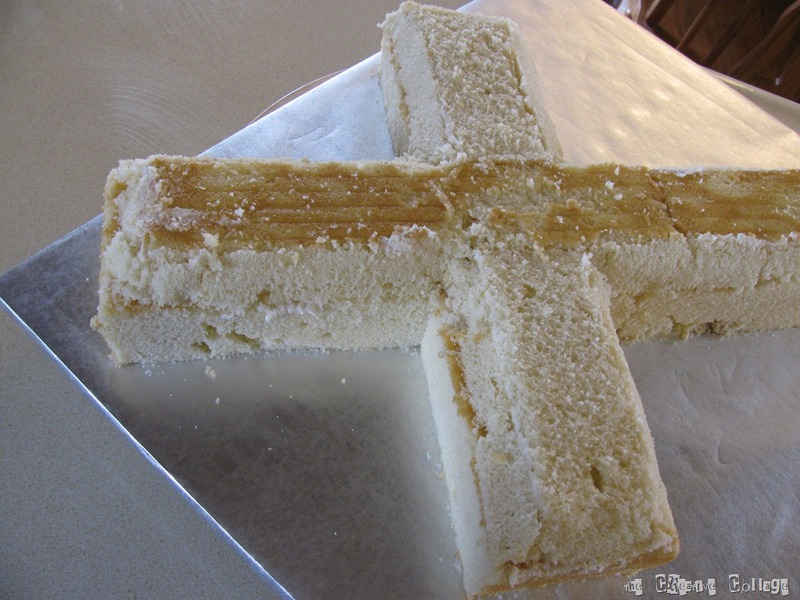 Well, hopefully this has inspired you to try a cross-shaped cake for your loved ones! This entry was posted in Decorated Cakes, Tutorial and tagged cross cake tutorial by Jo at theCreativeCollage.wordpress.com. Bookmark the permalink. Thank you so much for sharing your beautiful cake!! wow..it looks amazing!! I’ll have to go check out the viva method you used. It’s a pity you do72&8#1n;t have a donate button! I’d definitely donate to this outstanding blog! I suppose for now i’ll settle for bookmarking and adding your RSS feed to my Google account. I look forward to new updates and will talk about this blog with my Facebook group. Talk soon! I love this! I wish I had seen this a few months ago when my baby was baptized. Really sweet! This is gorgeous! It’s hard to believe it’s a cake. What a wonderful tutorial. Thank you for sharing it with at the Sister Saturday Easter Party! 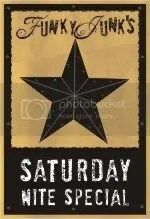 We are featuring this on our Facebook Page. 🙂 Have a beautiful Easter week! You are so talented! That large icing tip idea is awesome – I’ve never heard anyone say that before and I think it would save me from having such a problem with crumbs. Thanks! How many people does this cake serve. What recipe did you use? Hi Val – this cake serves around 20-25. Of course, it depends how large you cut the pieces! 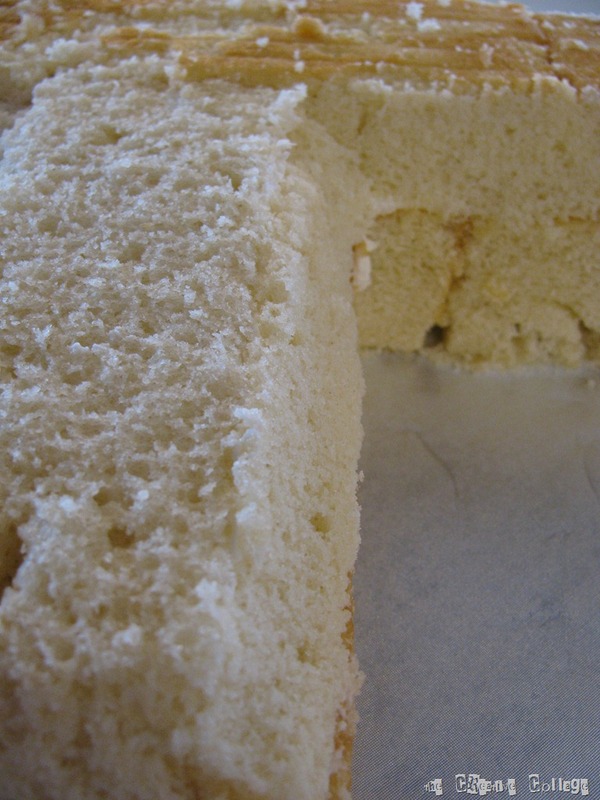 Pingback: Baptism Cakes | Welcome to the Creative Collage – Come In and Stay Awhile! This is truly a beautiful idea and a cake that looks amazing, thanks for posting this! HI! 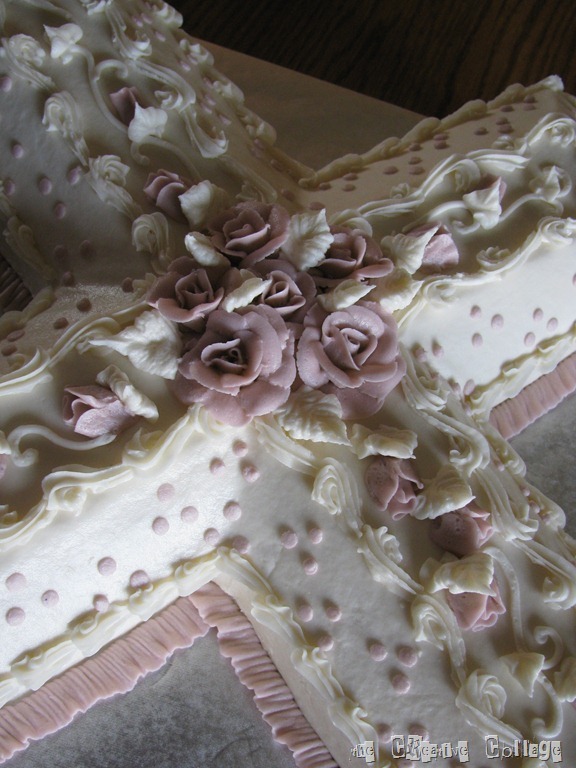 I am going to attempt a cross cake today and I am wondering how to make the beautiful ruffle around the bottom edge? Is is fondant or piped? Just need to point out ones write-up is usually as amazing. This clearness as part of your publish is excellent as well as i could think that you are a professional with this issue.